Create a variety of potato dishes quickly and easily with Idahoan® Slices. Easy to store, unpack and prep, our slices provide the quality of real Idaho® potatoes without the trouble of peeling, prepping and boiling. Idahoan Slices give your people more time to do all the other things they need to do in order to keep your kitchen efficient and profitable. 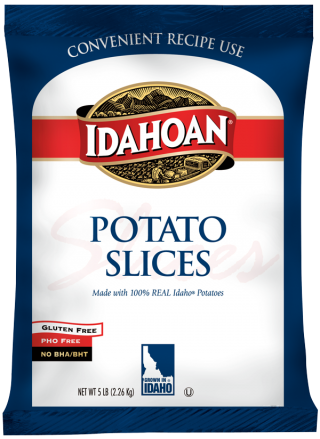 Idahoan Potato Slices are processed from sound, well peeled and trimmed 100% Idaho® Potatoes. Boil water according to chart below. Add desired salt and potato slices to boiling water. Simmer for 15 to 20 minutes, or until tender. Remove from heat. Cover and let set for 3 hours or overnight.